To the untrained eye, the games of tennis and ping-pong appear to have quite a lot in common, and even the use of the name "table tennis" invites frequent comparison between the two. For all their similarities in game play and equipment used however, each is undoubtedly its own distinct game, as you will see in this comparison article. Tennis is a sport played as a singles game, with two players competing against each other, and as doubles games, with two teams made up of two players each. The game requires the use of a racket that is to be used to strike a hollow rubber ball across the tennis court. Ping-pong is played with a similar setup of singles and doubles games, although the equipment and the playing field are much different. Ping-pong is also called table tennis, which signifies the rectangular table on which the game is played. 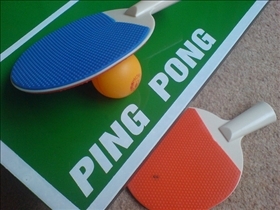 The players use small table tennis rackets to hit a correspondingly smaller ball made out of lightweight plastic across the tabletop divided by a low net in the middle. Tennis rules have stayed pretty much the same since the 1890s. One exception was the period from 1908 to 1960 when a rule was implemented requiring players to constantly keep one foot on the ground during serves. Another rule change occurred in the 1970s when the tie-break rule was adopted. In ping-pong, players are only allowed to have the ball bounce more than once on their side of the net at the first serve. After this, the ball should bounce only once on their side of the net, before it is returned to the other side and bounced on the opponent’s side of the net. The game proceeds in this manner in a fast and furious pace, until a player fails to return the ball according to the rules of the game. Extremely skilled players may also execute different hitting style, causing the ball to spin in a variety of novel trajectories, thereby confusing the opponent. Of course, a suitably worthy opponent will also have the skills and knowledge to react to these minuscule changes in the ball’s direction. In the world of tennis, the four Grand Slam tournaments held every year are considered the most prestigious events. These tournaments include the Australian Open, the French Open, Wimbledon, and the US Open. Ping-pong is quite popular in most parts of Asia and many parts of Europe, and its popularity has been on the rise in the United States as well. The most prestigious events in the ping-pong world are the World Table Tennis Championships, the Table Tennis World Cup, the Olympics and the ITTF Pro Tour, all of which are international tournaments. In addition, numerous countries all over the world hold events at the club level. Which game is easier to play in the winter?